One of the more disconcerting trends in the U.S. labor market since the end of the Great Recession is the divergence between the rate of hiring and the rate at which employers are offering jobs. Since June 2009, the number of hires has grown by 39 percent while the job openings have grown by 138 percent. If we think of job openings as a sign of labor demand, then why aren’t firms actually hiring the number of people that they seem to indicate they need based on their job postings? Some economists and writers have interpreted this divergence as a sign that employers want to hire, but they can’t find the right workers for the job. But there are other interpretations of this data that point to the change being related more to employers, rather than employees. First, let’s make the quick point about the “skills-shortage” argument, that would have us believe the relative dearth of hiring is because workers don’t have adequate skills. For this to be true, we’d expect employers to bid up the price of scarce workers and we’d see rising wage growth. 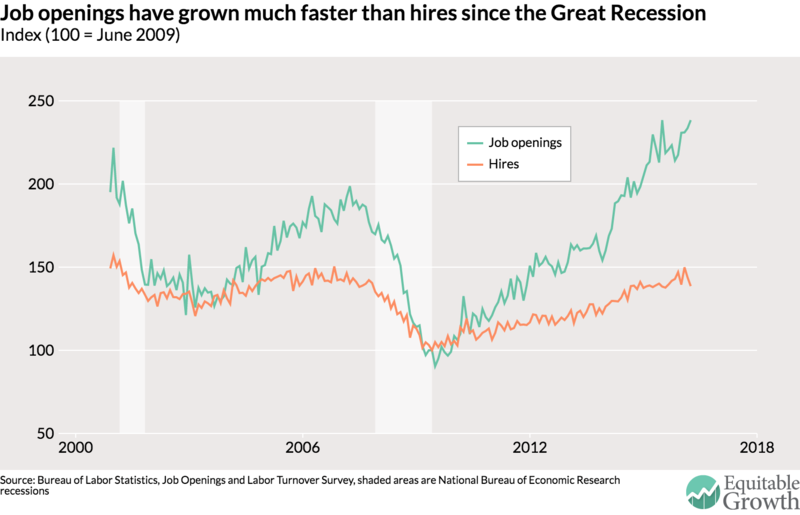 But openings have been growing faster than hires since mid-2010 and wage growth has not been accelerating over that time. So it seems unlikely that something on the worker side is a major part of this divergence. 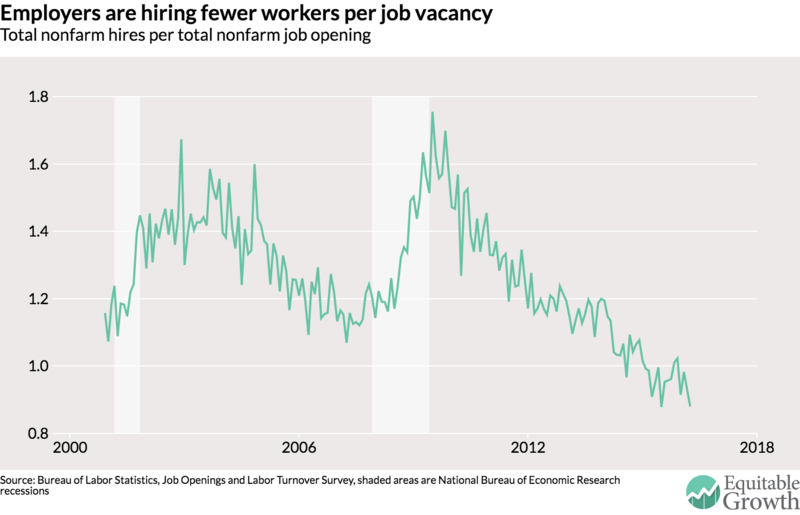 Another way to look at the hires-to-openings divergence is to look at what economists Steven J. Davis of the University of Chicago, R. Jason Faberman of the Federal Reserve Bank of Chicago, and John Haltiwanger of the University of Maryland call the vacancy yield , which is the number of hires per job opening in the economy. The vacancy yield actually jumps up during recessions as there are more unemployed workers to potentially hire and then declines during expansions. As of April 2016, there was only 0.88 hires for every one job opening. The yield for a vacancy is now quite low. Why is it so low? Looking at changes in the yield since the end of the Great Recession, Davis, Faberman, and Haltiwanger find that a lot of it is due to a decline in recruiting intensity by employers. In other words, employers are doing less to actually fill the vacancies they are posting out there in the labor market. Ben Casselman points out this change might have to do with changes in how companies recruit. The cost of a job posting—simply throwing up an add on a website—may have declined thanks to the internet, so it’s much easier to post jobs than to complete the process of filling them. Or perhaps the reduction in the cost of a job posting is because firms are more profitable now and know the relative cost of employing another worker isn’t that high anymore. Furthermore, this reduction in job filling may be due to the consolidation of companies, as the paper by Davis, Faberman, and Haltiwanger shows that vacancy yields are lower at bigger firms. These research findings and hypotheses indicate there may have been a change in the labor market since the end of the Great Recession. But rather than a change among the sellers of labor—workers—it may have more to do with the buyers of labor: employers. More thought should be focused on how firms have changed their hiring practices over the past seven years or perhaps since the mass adoption of internet job hunting. This effort may have a higher yield than other research investments.